Lavender lovers, this one's for you. 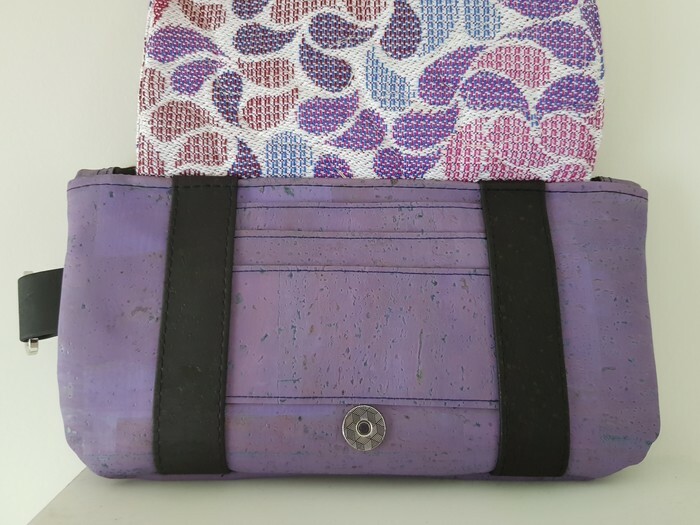 A sweet & petite little lavender clutch made from soft cork leather with a wrap scrap feature flap (Lenny Lamb Colours of Fantasy). 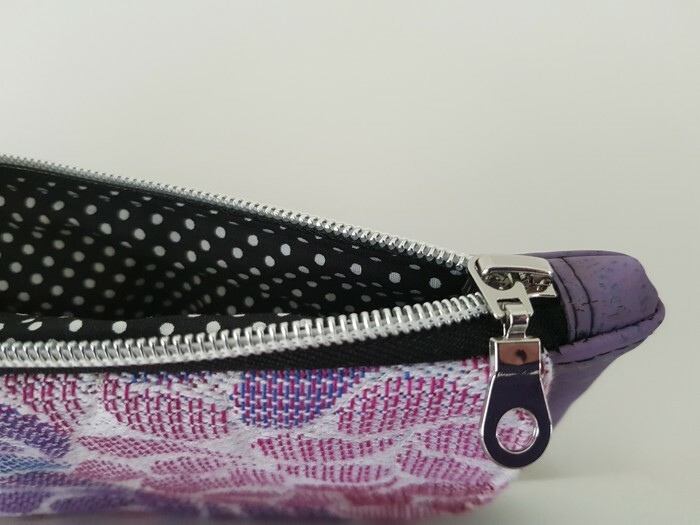 The flap covers 3 handy card slots, and the main pocket secures with a shiny silver zipper. There are two black flaccents and it comes with a detachable black wrist strap. Big enough for your essentials on a day or night out, but certainly won't weigh you down. Cork leather is a renewable and sustainable fabric made from the bark of cork trees. The bark is harvested every 9 years, without killing the tree, meaning it is renewable and environmentally friendly. It is a vegan alternative to traditional leather, with many of the same properties as leather - soft, durable and strong. It is also treated to be water resistant, can be wiped clean with a damp cloth. "Wrap scrap" is woven fabric originally made for baby carriers. They are usually "jacquard" fabrics, meaning the design is woven in different coloured threads, rather than having a design printed onto a length of fabric. 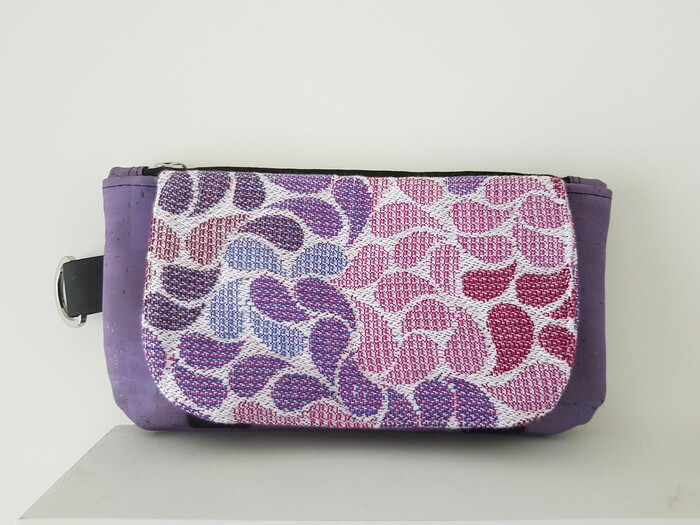 I use the offcuts from the manufacturing process, and sometimes repurposed wraps, in the manufacture of my bags. Woven wrap fabric is designed to be highly durable, and is made from premium textiles - usually cotton, linen, tencel, bamboo or silk. It is thicker and more sturdy than apparel or quilting fabrics, closer to the fabric you would use for upholstery. The durability of the fabric makes it highly suitable for bag making. Woven wraps are a luxury textile; made in limited release numbers and beautiful designs. Wrap scrap is not only attractive and unique fabric, it is also a way of saving production waste and recycling fabric which would otherwise be thrown away. We recommend spot cleaning your clutch if needed, or gently hand washing if it is highly soiled. Machine washing is not recommended. INTERNATIONAL SHIPPING: International shipping price listed is an estimate. Please contact me for a specific quote to your country if you need international shipping. Items will not be posted until payment is received. Please contact directly if you need to discuss payment options.